Wales is a land steeped in legend and folklore. Much of the folklore relates events of a paranormal nature. 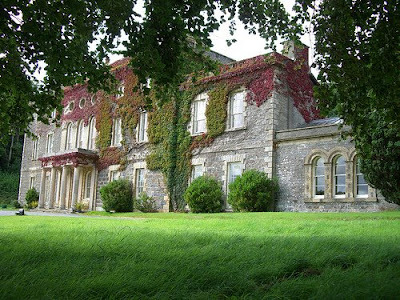 Nanteos (pronounced Nant-ay-oss) Mansion is rumoured to be one of the most haunted buildings in Wales. This Grade I listed Georgian country house was built in 1738, by William Powell. However, it is believed a much earlier dwelling had existed on the same site for many generations previously. The house lies in extensive private grounds, near the popular coastal town of Aberystwyth (Abba-rust-with), in the county of Ceredigion (Carer-dig-eon), West Wales. The ownership of the house stayed within the Powell family until the 1950's. Numerous ghosts are said to haunt the house and grounds of Nanteos. William Powell's wife, Elizabeth, often referred to as the 'Jewel Lady', is said to roam the house in spectral form. William Powell absolutely doted on his wife, and gave her many fine pieces of jewellery during their marriage. According to local folklore, Elizabeth could not bear to be parted from her jewels and was worried what their fate would be after her time. When she knew she was dying, she struggled from her death-bed, and secreted her precious gems away somewhere within the house, just hours before her death. Her restless spirit, clad in a long, flowing gown, is said to be still searching for the gems to this very day. Local legend warns would-be treasure hunters that Elizabeth will haunt anyone who tries to unearth her precious treasure. Perhaps it was Elizabeth's spirit that frightened the wits out of a man who peered into the hall, from the front doorway. He saw what he presumed was smoke, billowing around the hallway. To his absolute horror, the smoke is said to have solidified into the form of a woman wearing a long, flowing gown. The apparition approached the front door, closing in on the witness. The hapless man was so utterly terrified, that he took to his heels and ran, not stopping until he reached Aberystwyth, some three miles away. Maybe Elizabeth thought he had come to steal her jewels? Another ghost said to haunt Nanteos, is that of a harpist, Gruffydd Evans, a relative of the Powell family. For sixty nine years, Evans entertained the Powells at Christmas, and many people say his ghostly harp can still be heard playing some nights, emanating from woodland adjacent to the house. A phantom horse and carriage is also rumoured to head along the driveway to the house in the middle of the night, halting at the front door, as if waiting to collect someone. The Pink Room is said to be the most haunted room in Nanteos. A ghostly woman apparently haunts the room, and has been seen scurrying down a nearby staircase, carrying a candle. Her ominous manifestation is said to foretell the death of a member of the Powell family. Perhaps this spirit was the same one that terrified a young nurse-maid called Mary, as she slept in the Pink Room, to be close to her sick charge, the lady of the house. The young maid woke up one night, to see a spectral figure looming over her. The girl screamed. The figure straightened up, and exited the room via a closed door. Mary refused to sleep in that room ever again. Possibly the same phantom manifested during a later party at Nanteos. An army officer staying at the house, headed to his room to dress for dinner. On the stairs, he encountered a beautiful lady in an evening gown, carrying an unusual-looking candlestick. He assumed she was a fellow guest, so the chivalrous gentleman bowed and bade the lady good evening. She, in turn, appeared to be unaware of his presence, and simply continued to descend the staircase. Puzzled, the man went on his way. His curiosity grew greater when he saw no sign of the lady at the party. He made inquiries about her, and was warned not to talk about her, or a member of the Powell family would die. Local legend holds that a member of the family did, in fact, die on that night. Nanteos is also said, at one time, to have been home to the Holy Grail, a wooden chalice allegedly used by Jesus Christ and his disciples during the Last Supper. 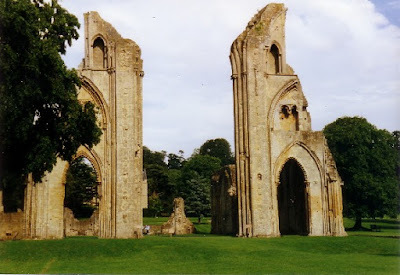 According to legend, Joseph of Arimathea brought the Grail to the British Isles in AD 63, before making his home at Glastonbury Monastery, which later became Glastonbury Abbey. Between 1536 and 1541, Henry VIII ordered the dissolution of the monasteries, whereby monastic communities were disbanded, and their property seized. It is said that some of the monks at Glastonbury escaped Henry VIII's henchmen, and fled to Strata Florida Abbey, a few miles from Nanteos, taking the Holy Grail with them for safe-keeping. 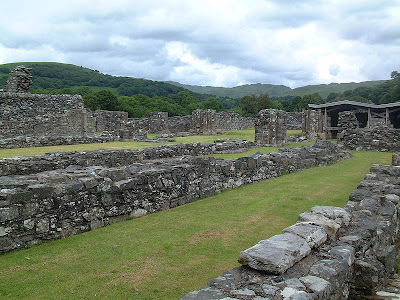 Strata Florida Abbey eventually found its way into the hands of the Powell family. A wooden cup did indeed come into the possession of the Powells. But was it really the Holy Grail? Many people certainly believed so. The cup quickly gained a reputation for having healing powers, and many people drank water from it, hoping to be healed of their illnesses. In fact, it is said that the cup suffered much damage, because sick people would often gnaw at the wood, in order to accelerate their healing. The cup is said to be stowed somewhere safe, at a secret location in the county of Ceredigion. Composer, Richard Wagner is rumoured to have stayed at Nanteos, and the legend of the Nanteos Grail is often cited as the inspiration for his opera, Parsifal. Whatever the truth may be about the ghosts and legends of Nanteos Mansion, the house's reputation has intrigued many generations, and continues to do so, even to the present day. Earlier this year, the 'Ghost Hunters International' team paid a visit to Nanteos, to investigate the legends. The results of their visit can be seen in the following YouTube clips. Lovely article! Nice to have you back to blogging! Thanks, Lesley. I've got a few more articles planned for this week.